When it comes to smartphones people often go gaga for specs and while beefy processors and gigabytes of RAM always sound good, quality software can be a real game changer. For example, Samsung’s new Galaxy S5 ships with a 2.5GHz quad-core processor pushed by 2GB of RAM. On paper this handset should breeze through everyday tasks and crush a bargain bin device like Motorola’s Moto E in any performance-based challenge. Sure, Motorola’s newest smartphone packs a modest 1.2GHz dual-core Snapdragon processor and 1GB of RAM, but this $130 handset has a secret weapon — it’s running near-vanilla Android. While Samsung’s new flagship would make short work of the Moto E in a benchmark challenge, you’d be surprised to see how Motorola’s budget-friendly device holds up in a real world performance test filled with tasks like: unlocking the phone, using its camera and launching various applications. Here’s a look at the two devices in action. 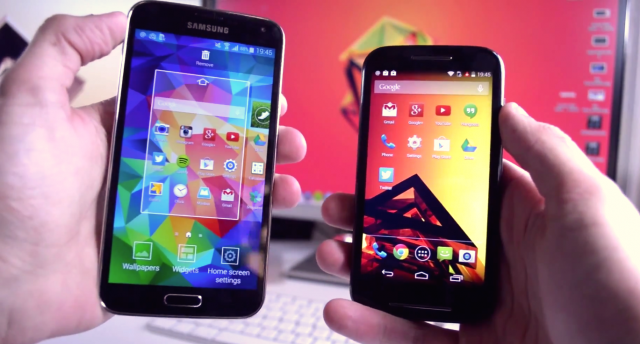 Now of course we’re not saying the Moto E is a better phone than the Galaxy S5, however this demonstration is a prime example of how software can be a huge difference maker. In this case, Samsung’s TouchWiz is weighing down the GS5’s hardware so badly, it occasionally lags behind a device with pretty much half of its power.